Door stiles and rails as well as the face frames are made from solid wood, with a deep Cherry finish. The Heritage Cherry Bathroom Vanity collection offers an unrivalled elegance in your bathroom design. The Heritage Cherry Collection features fluted columns down the sides of the front, dentil molding and trim along the top, and distinctive, cube-like drawers on the larger sized vanities. The architectural details in the Heritage Cherry Vanity Collection make it an excellent choice not only for traditional bathroom décor, but for Victorian and period homes as well as Old World and elegant designs. For a vintage or antique charm with the Heritage Cherry Vanity, add a marble top and porcelain, hand-decorated under mount sink to infuse traditional elegance to a master bath retreat or guest bath. For a more modern approach, granite or a manufactured, low-maintenance quartz can add a sleek, more modern appeal for the Heritage Cherry Collection. Let lighter color countertops contrast and highlight the rich, warm Cherry finish of these cabinets. While the Heritage Cherry Vanity Collection comes with nickel knobs, which is one of our favorite finishes in the bathroom, we also love the look of an aged bronze or aged brass for faucets and knobs with this series. As for color palettes, the rich Cherry finish plays off the warmer color palettes well, such as a rich, ochre yellow mixed with classic earth tones. The cooler color palettes, such as blues and greens, offer more of a contrast, and we tend to like the deeper shades a bit more with the Heritage Cherry Vanities. As for flooring, tile is always a favorite in the bathroom, and looks great with the Heritage Cherry Collection, but we have used elegant hardwood flooring in the bathroom in a contrasting tone, and the look was rich and elegant (particularly in a half bath). Larger floor tiles look best for a cleaner look that sets off the architectural moldings and columns on the cabinetry. If your Heritage Cherry vanity is being used in a smaller half bath, marble tiles with a rich vein running within are an outstanding, elegant look. 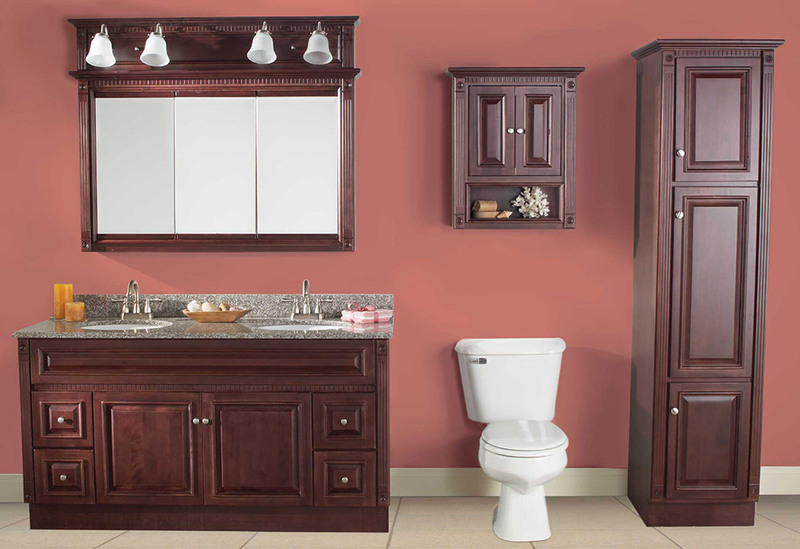 Heritage Cherry Bathroom Vanities offer top-of-the-line elegance and detailed architectural features that today’s master bath retreats and guest baths command. With its quality construction and classic good looks, the Heritage series will be sure to grace your home with a timeless style for many years.